Salt, pepper, and caffeine. What do these three things have in common? They can all be sprinkled on food. Okay the last one is fairly new to the sprinkling world, but don't judge it. That's my job! So let's see whether or not we should welcome CaffeinAll to the insanely long list of instant energy products. I can feel the caffeine-induced enthusiasm already. With a host of caffeine products invading the market, we will see exactly what CaffeinAll is about; what makes it different, how much it costs, any potential ill effects it may have, and most importantly whether it is capable of joining the caffeine-fueled forces currently leading the aforementioned invasion. A sprinkling of caffeine anyone? As can be seen from the video below, that is if you can stand the unforgivably bad and presumably original theme song, CaffeinAll is caffeine which you can control. You can sprinkle as little or as much as you like, which reduces both the time and effort needed to get your daily boost of caffeine goodness. CaffeinAll markets itself as a cheap and quick way in which people can get their caffeine fix. The team behind the product also claim that, unlike normal caffeine, CaffeinAll will add no taste to your food, simply providing instant energy should you not have time to sit lovingly nursing a cup of coffee in your local cafe. Among the perks of this product we must surely mention the price. 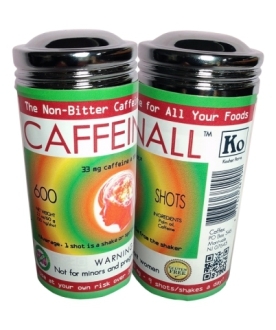 At 10 cents for 30mg of caffeine there are not many products which can beat it, but be aware, the CaffeinAll site warns customers that exceeding 100mg is something they do at their own risk. This last bit, whilst not setting off alarm bells, just doesn't seem very, errrrr, appetizing. Whilst the convenience of tasteless caffeine which can be easily sprinkled on food is undeniable, for me it seems a little strange, as do many of these products, which are placing increasing significance on acquiring energy in the quickest and easiest way possible. Having said this, I assume that the product is aimed more at athletes and fitness enthusiasts than anyone else. If you want to buy this product, and more importantly check exactly how much you should take each day, you can click here, and let us know how you get on.